There is no more legal hurdle to the government’s plan to allow the burial of former President Ferdinand Marcos at the Libingan ng mga Bayani. By a vote of 9-5, the 15-man SC dismissed the consolidated petitions seeking to stop the burial backed by no less than President Rodrigo Duterte, according to SC spokesman Theodore Te in a press conference. Associate Justices Presbitero Velasco, Diosdado Peralta, Lucas Bersamin, Arturo Brion, Mariano del Castillo, Jose Perez, Jose Mendoza, Teresita Leonardo De Castro, and Estela Perlas-Bernabe gave the greenlight to the burial. Chief Justice Maria Lourdes Sereno led the dissenters. She was joined by Senior Associate Justice Antonio Carpio, and Associate Justices Francis Jardeleza, Marvic Leonen and Alfredo Benjamin Caguioa. Associate Justice Bienvenido Reyes, a fraternity brother of the President at the San Beda College of Law, inhibited from the deliberations due to reported close relations with a party in the case. There was also no law barring the transfer of Marcos’ remains to the Libingan ng mga Bayani and that Duterte was not bound by the 1992 agreement entered into by the Marcos family and then President Fidel Ramos to have the remains interred in Marcos’ hometown of Batac, Ilocos Norte. “As the incumbent, President Duterte is free to amend, revoke, or rescind political agreements entered into by his predecessors and to determine policies which he considers, based on informed judgment and presumed wisdom, will be most effective in carrying out his mandate,” Te said. The SC also found that under the Administrative Code, the President has the power to reserve any public land for public use and for specific public purposes. “According to the majority, the disbursement of public funds to cover the expenses incidental to the burial is granted to compensate him for valuable public services rendered,” Te said. “In this regard, the majority also considered that the President’s determination to have Marcos’ remains interred at the Libingan ng mga Bayani was inspired by his desire for national healing and reconciliation,” he added. The Court also shot down the petitioners’ contention that the Libingan burial was motivated by Duterte’s debt of gratitude to the Marcoses, who supported the former Davao City mayor in the May presidential election. “As the purpose is not self-evident, petitioners have the burden of proof to establish the factual basis of their claim. They failed. Even so, this Court cannot take cognizance of factual issues since we are not a trier of facts,” stated the decision penned by Justice Peralta. “We agree with the proposition that Marcos should be viewed and judged in his totality as a person. While he was not all good, he was not pure evil either. Certainly, just a human who erred like us,” the decision read. The SC disagreed that Marcos had been “dishonorably discharged” following his ouster in 1986, noting Marcos was recognized by the Philippine Veterans Affairs Office as a war veteran under Republic Act 6948. The Court added that Marcos was not convicted by final judgment of any offense involving moral turpitude. “It is our sincerest hope that this will lead the nation towards healing as we endeavor to move the country forward to give every Filipino a better life,” the former lawmaker said in a statement. Petitioner and Albay Rep. Edcel Lagman, meanwhile, vowed to appeal the ruling. “While I respect the decision of the Supreme Court, I am puzzled to no end why the majority of the High Court would allow the burial of a judicially and historically confirmed despot, plunderer and transgressor of human rights in the Libingan ng mga Bayani,” Lagman said. “Motions for reconsideration are in order for a reversal of the majority decision,” he added. Duterte believed Marcos should be buried at the Libingan ng mga Bayani since he was a soldier and former president. The government also said there was no law prohibiting Marcos from being buried at the Libingan ng mga Bayani, a cemetery reserved for soldiers, former presidents, national artists and statesmen, and that it is within Duterte’s power and prerogative to allow it. Duterte’s decision did not sit well with Martial Law victims and rights groups, who argued that only those who can serve as an inspiration and as models for emulation can be buried at the military shrine, citing Republic Act 289 as basis. 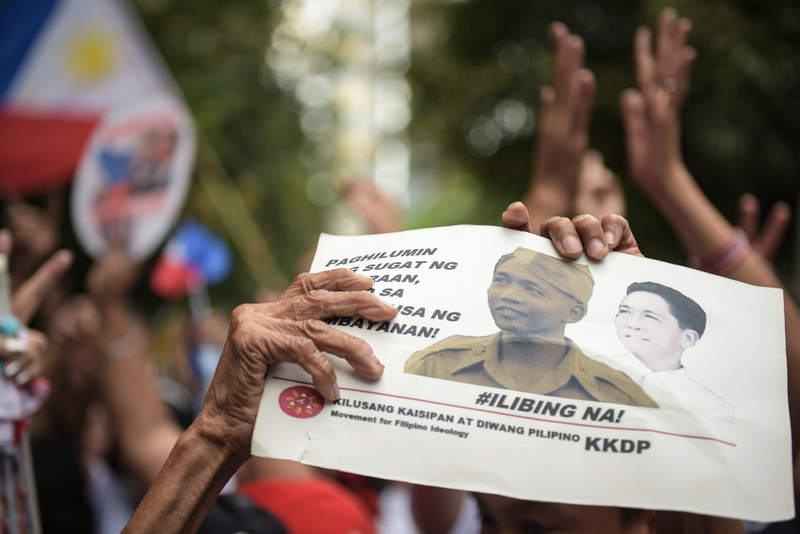 But the government clarified that the late strongman would not gain the status of a “hero” as it acknowledged the “dark pages of history during Martial Law,” during which thousands had been killed and jailed for opposing the dictatorship. Marcos died while on exile in Hawaii in 1989, three years after he was ousted from the presidency through the People Power revolt in February 1986. His remains, brought home in September 1993, lie inside a glass coffin and on public display at the Marcos Museum and Mausoleum in Batac, Ilocos Norte.